Many businesses do not adequately document pay disparities. An incubator nabs legal counsel; cannabis trafficking keeps law enforcement busy and Eugene firm takes on massage franchise sexual assault case. Pressure mounts to change an antiquated Oregon jury rule. Sussman Shank LLP is proud to announce the launch of our blog Tracking Data, the firm's newest resource dedicated to discussing news, updates, and in-depth analysis of developing privacy and data security issues affecting business in the Pacific Northwest and throughout the United States. Tracking Data will be managed by Sussman Shank's Privacy and Data Security practice area, whose members have an understanding of, and experience in, counseling clients on issues related to data breaches and laws relating to finance, telecommunications, media, and internet privacy. Our attorneys include seasoned litigators, corporate advisors, a Certified Information Privacy Professional for the United States (CIPP/US), and a co-author of the Proskauer on Privacy treatise (published by PLI). In creating this blog, our team is motivated to assist our clients and readers in proactively identifying, evaluating, and managing risks related to privacy and information security. "The launch of Tracking Data gives us the opportunity to provide accessible content that not only informs, but enlightens our clients and friends on the cutting-edge challenges in cybersecurity," said Kristen Hilton, CIPP/US and a member of the International Association of Privacy Professionals. "We are excited to provide counsel and a comprehensive range of commentary on an important issue that affects all businesses." About Sussman Shank LLP Founded in 1960 in Portland, Oregon, Sussman Shank is a full-service business, litigation, and commercial bankruptcy law firm with over 30 lawyers. Our clients include public and private companies, government entities, institutions, non-profit organizations, and individuals. 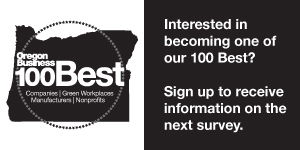 Sussman Shank has once again been named one of the 2018 "100 Best Companies to Work for in Oregon" by Oregon Business Magazine, marking our 12th year on the list. Thanks to the leadership efforts of Sussman Shank LLP's Sustainability Committee, the firm is proud to announce it has achieved Sustainability at Work's Gold Certification for the next three years, through 2020. The certification recognizes the firm's commitment to helping make Portland one of the cleanest, most sustainable cities in the country. Sustainability at Work was formed in 2007 as part of a City of Portland initiative to help businesses improve their environmental practices. This program has been informed by national and local research, input from Portland businesses, and by the expertise of local partners to provide participants the tools needed to succeed in their sustainability efforts in the workplace. Sustainability at Work offers three levels of certification to recognize businesses' positive impacts on the environment and community: Gold, Silver, and Certified. In order to receive Gold Certification within its office environment, Sussman Shank completed many actions to maintain daily sustainability. • Caterers who follow sustainable practices – reusable dishware, buffet style serving, minimal packaging, etc. • A system in place to gather employee feedback, comments, and suggestions related to sustainability actions at work. This includes our annual State of Sustainability meeting, blurbs in our Daily Buzz, and a Sustainability Committee available at all times. • Alternative transportation for work-related trips whenever possible (walk, bike, transit, carshare, carpool, and/or electric vehicles). • Bicycle tire repair kit, air pump, and a spare lock are available for employees and visitors. • Occupancy sensors for lighting are used throughout the office. • Yearly participation in the Bike More Challenge. • Two-week pedometer challenge each year to encourage employees to walk more. • Recycling and compost receptacles are provided in eating areas. Sussman Shank's Sustainability Committee chair, Steven Mayock, shares, "The Sustainability Committee is constantly evaluating our practices to see how we can have less of an impact on the environment while still providing quality service to our clients. It's great to be recognized for our efforts, but this doesn't mean our work stops here." Earning Sustainability at Work's Gold Certification is an honor, and Sussman Shank looks forward to its continued and improved initiatives toward sustainability. An attorney at Miller, Nash, Graham & Dunn talks about how to create a trans-friendly work environment.